Economist's View: "A Dark Age of Macroeconomics"
"A Dark Age of Macroeconomics"
A Dark Age of macroeconomics (wonkish), by Paul Krugman: Brad DeLong is upset about the stuff coming out of Chicago these days — and understandably so. First Eugene Fama, now John Cochrane, have made the claim that debt-financed government spending necessarily crowds out an equal amount of private spending, even if the economy is depressed — and they claim this not as an empirical result, not as the prediction of some model, but as the ineluctable implication of an accounting identity. What’s so mind-boggling about this is that it commits one of the most basic fallacies in economics — interpreting an accounting identity as a behavioral relationship. Yes, savings have to equal investment, but that’s not something that mystically takes place, it’s because any discrepancy between desired savings and desired investment causes something to happen that brings the two in line. ... [A]fter a change in desired savings or investment..., if interest rates are fixed, what happens is that GDP changes to make S and I equal. In this picture savings plus taxes equal investment plus government spending, the accounting identity that both Fama and Cochrane think vitiates fiscal policy — but it doesn’t. 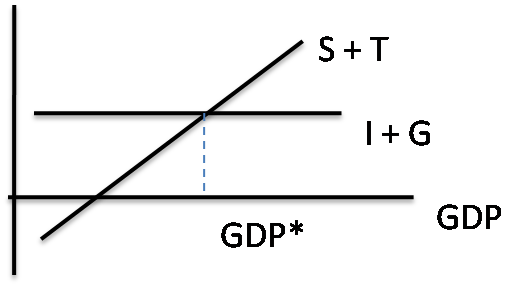 An increase in G doesn’t reduce I one for one, it increases GDP, which leads to higher S and T.
Now, you don’t have to accept this model as a picture of how the world works. But you do have to accept that it shows the fallacy of arguing that the savings-investment identity proves anything about the effectiveness of fiscal policy. So how is it possible that distinguished professors believe otherwise? The answer, I think, is that we’re living in a Dark Age of macroeconomics. Remember, what defined the Dark Ages wasn’t the fact that they were primitive — the Bronze Age was primitive, too. What made the Dark Ages dark was the fact that so much knowledge had been lost, that so much known to the Greeks and Romans had been forgotten by the barbarian kingdoms that followed. And that’s what seems to have happened to macroeconomics in much of the economics profession. The knowledge that S=I doesn’t imply the Treasury view — the general understanding that macroeconomics is more than supply and demand plus the quantity equation — somehow got lost in much of the profession. I’m tempted to go on and say something about being overrun by barbarians in the grip of an obscurantist faith, but I guess I won’t. Oh wait, I guess I just did. Given their understanding of macroeconomics, and I mean the basics not the hard stuff, it's becoming a lot easier to understand how financial economists missed the developing bubble and the effect it would have on the macroeconomy. We specialize mightily in academic economics, people will work on very narrow questions for their entire careers and become world class experts on that question, but they tend to forget what they learned in other areas over time, and they can't possibly keep up with developments outside their areas of specialization. So we rely and depend upon the expertise of others to inform us about areas in which we don't normally work. One thing I've learned from the current episode is not to automatically trust that the most well-known economists in the field have done due diligence before speaking out on an issue, even when that issue is of great public importance, or even to trust that they've thought very hard about the problems they are speaking to. I used to think that, for the most part, the name brands in the field would live up to their reputations, that they would think hard about problems before speaking out in public, that they would provide clarity and insight, but they haven't. In fact, in many cases they have undermined their reputations and confused the issues. People have been deferential in the past, myself included, and these people have been given authority in the public discourse - even when they are demonstrably wrong their arguments show up in the press as a "he said, she said" presentation. But, unfortunately for the economics profession and for the public generally, the so called best and brightest among us have not lived up to the responsibilities that come with the prominent positions that they hold.